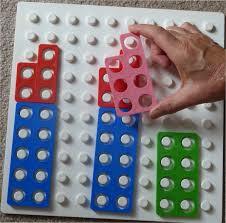 It is only in the last few years that I have discovered the wonderful maths resource called Numicon. This year, I can honestly say I have used it as part of our continuous maths provision. At school, my LSAs were offered Numicon training. Two sessions later and they came back raving and waving the resources and documents. 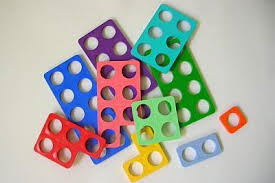 I had a quick read through but if I am honest, I am more of a kinestetic learner so I jumped right in and set up a table in the classroom full of Numicon boards and pieces. I sat down and started to make arrangements with the different pieces on a board. I was so engaged as to what I was doing that before long I had a table full of children! Between us, we were matching pieces, counting the holes of the different pieces. I liked the fact that the pieces were coloured and before long I was calling numbers and the children were able to find the matching pieces. I left the children to their play and observed. Two children had taken the white boards and placed them on the carpet. Between them they had found another set of Numicon pieces and a sand timer. One turned over the sand timer and said go. I watched with amazement as these children tried to fill up the board with different pieces, carefully turning the pieces around like a jigsaw to make them fit, it was a game that engaged and encouraged more children so that before long the carpet was full of boards and Numicon pieces. Children joined each other and were working together to fill up their boards first. Allowing the children to experiment with the pieces first gave them the ownership over the resources. The conversations they were having between themselves meant that they were sharing their ideas then challenging themselves to extend their learning leading to their ownership of the activity. There were so many opportunities for children to problem solve and for us as practitioners to ask the key and vital questions of “how and why” without the children feeling overwhelmed. It created opportunities for children to explore their own ideas and thinking for as long and in depth as possible and many wanted to record their learning some opting for taking photos on the iPads, whilst others saved their boards for the following day. As the children were active and engaged in the learning we continued to add different things to the Numicon table over the course of the week. Using bingo pens proved a hit, children enjoyed mark making with the Numicon, and again this led to children trying to order the numbers to 10. Using playdough and the Numicon pieces as cutters again proved popular. Plus adding number stamps, lots of opportunities for counting and number recognition. The following week I used Numicon for the first time during my carpet sessions. I did not need to introduce the children to the different pieces as I had given them the opportunity during their free flow learning to develop their understanding of the resources by adding to the continuous provision that was available for them. That added to the fact that the resources are all well labelled meant that children added what they needed to the Numicon. Throughout the year we were able to order numbers using the pieces, add numbers together, look at odd and even numbers, find different totals that make 10, look at partionning numbers… And the list goes on! As for displays, we created a number line using the bingo pens to go on the wall with Numicon pieces to 30 and we created our own working wall with velcroed pieces that the children could move with number cards and whiteboards. I had downloaded from Twinkle some Numicon posters, however I found I didn’t really need them as the children, as always, had created their own display that they used as part of their daily learning so instead my LSA used them as part of an intervention with some key children. Allowing children the time and freedom to explore with Numicon resources meant half of my job was already done when I came to use the resources more formally myself during a carpet input. That added to the fact I know that Numicon is used widely in Year 1 at my school has meant that this cohort are better prepared for certain aspects within the National Curriculum. They really enjoyed using the resource this year as it’s a fun and stimulating way to teach a very hands on subject. I know that I am looking forward to building on the provision of Numicon from this year with the new Reception cohort that will start in September! Check out my Pinterest link for more Numicon ideas!